Billionaire Andreas Samaras is nobody's fool. And his beautiful new employee Carrie Rivers – an undercover journalist – is playing a dangerous game. 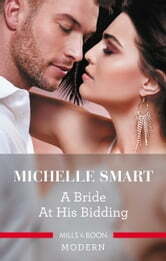 He'll keep her at his command until he can expose her deception. But when her ruse is revealed there's only one way to protect his spotless business reputation: blackmail innocent Carrie to the altar!